Our apologies in advance, dear readers: due to the circumstances detailed in our preceding entry, we found ourselves going a little overboard this year. We usually don't indulge so heavily (sure) in holiday gift-giving, but it seemed completely justifiable in 2012. We assure you that we'll do our best to curb our conspicuous consumption from now on! 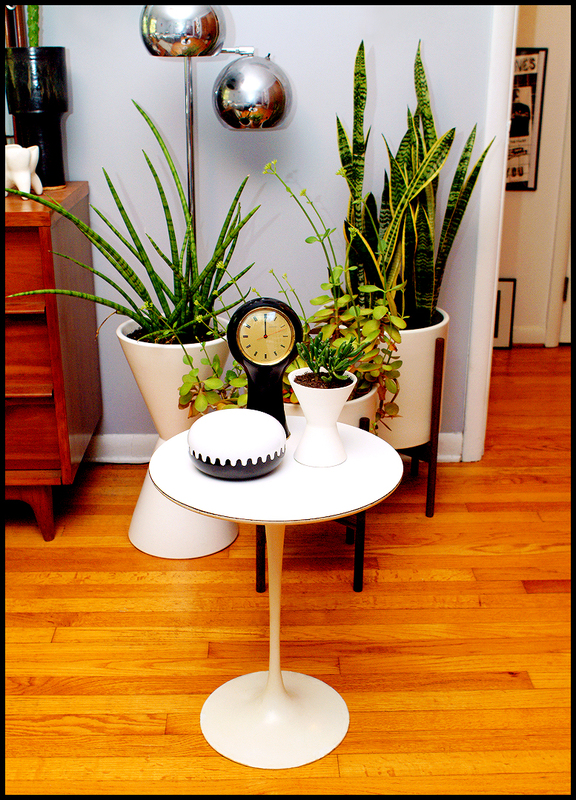 In appreciation of her infinite patience, I'd promised Valery that I'd get her an original Saarinen side table once I was done with grad school and had a real job. Voila! 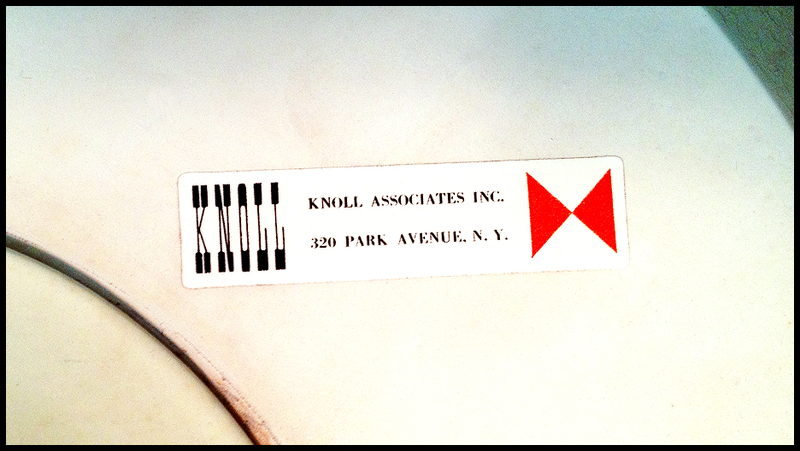 It's an early example with a pre-zip-code Knoll label and a base that seems to weigh fifty pounds! Here's a close up of the tag. It sure is purty! 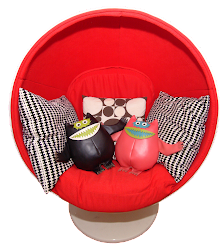 I'm the first to admit that I'm impossible to shop for, but Valery outdid herself this year by convincing our Danish pal, Jannie, to sell us the gigantic, quizzical bird in the middle. We'd spied this eleven inch (!!!) fledgling on Flickr two years ago—and it sent us searching everywhere with no results. A big thank you is due to both Valery and Jannie! Never one to stand still, Valery tracked down the nubby guy on the right and also included him as one of my gifts. 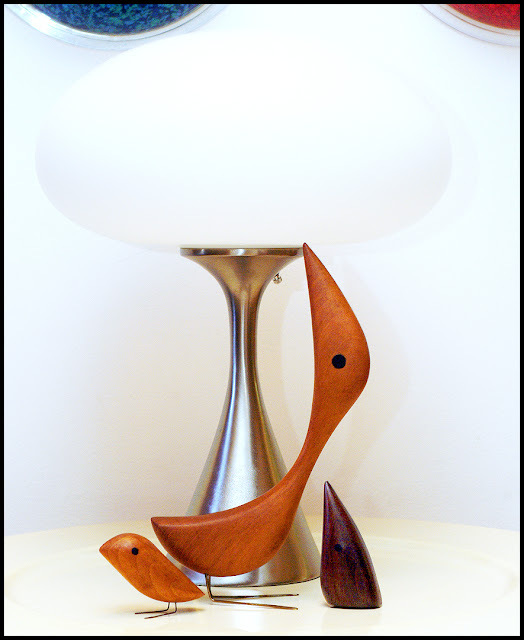 Does anyone know who's responsible for designing and/or producing these vintage birds? All three are marked Denmark and have a distinctive double axe insignia. We'd love to solve this mystery! Our Laurel lamp is included for scale. We've already blogged about the six vintage Georges Briard Your Pickled Personality glasses we found for $12 back in 2009. We thought we'd scored the entire run in one fell swoop—that is until our Instagram buddy, Holly, emailed us that she'd found a set that included two glasses we'd never seen before. After months of (persistent needling) friendly emails, Valery got Holly to part with 'em just in time for the holidays. A big thank you to you both! 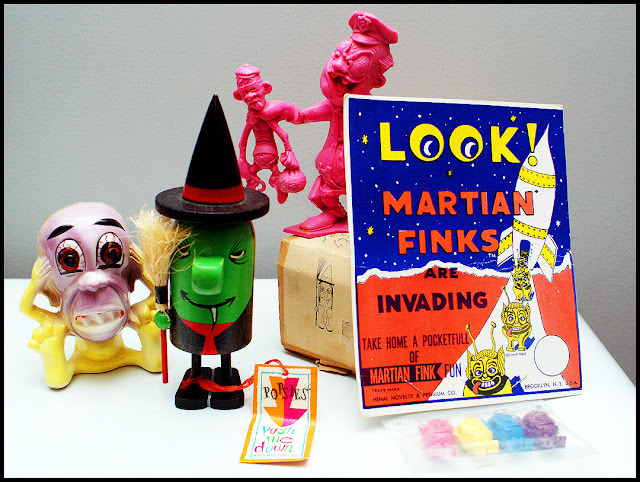 We should also note that this is the only complete set we've been able to find anywhere. Although not nearly as well known as Briard's Name Your Poison series, we'd argue that the Your Pickled Personality set is infinitely more scarce and desirable—poking fun at mental illness was likely never a popular selling point. Like the aforementioned, this series was also available in two sizes. 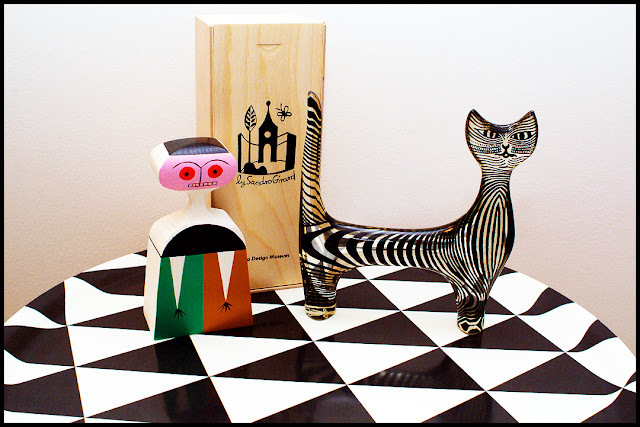 It was an Op Art Christmas: Valery lucked out and received the large (7") Abraham Palatnik cat she'd been looking for forever, as well as the jumbo (18" across) Plattan tray designed by Barbro Tryberg. Our first Alexander Girard figure was a present mysteriously left behind by Santa. Hmmm. A deranged ceramic figure, a Nutty Mad, Martian Finks and a mint Popsie witch still in its original box? Yes! All of these presents ended up stuffed in my stocking (with care). Similarly, some gifts materialized in Valery's stocking overnight. 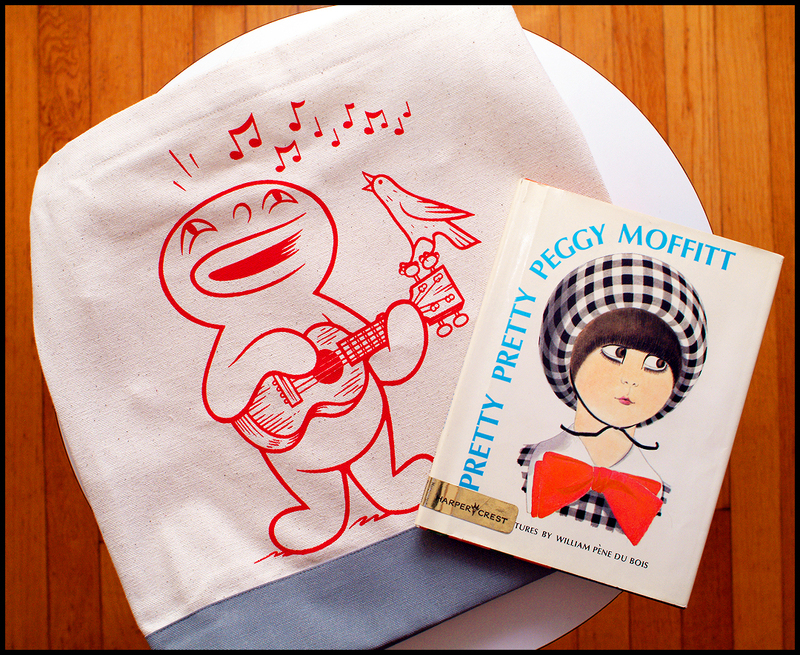 A Sof' Boy tote bag produced by PressPop and a first printing of William Pene Du Bois' book, Pretty Pretty Peggy Moffitt—a children's tale about the inimitable 60s icon. Our buddy, Mike, is the king of funneling quality goods into GG&S HQ, and Christmas is always his favorite excuse. 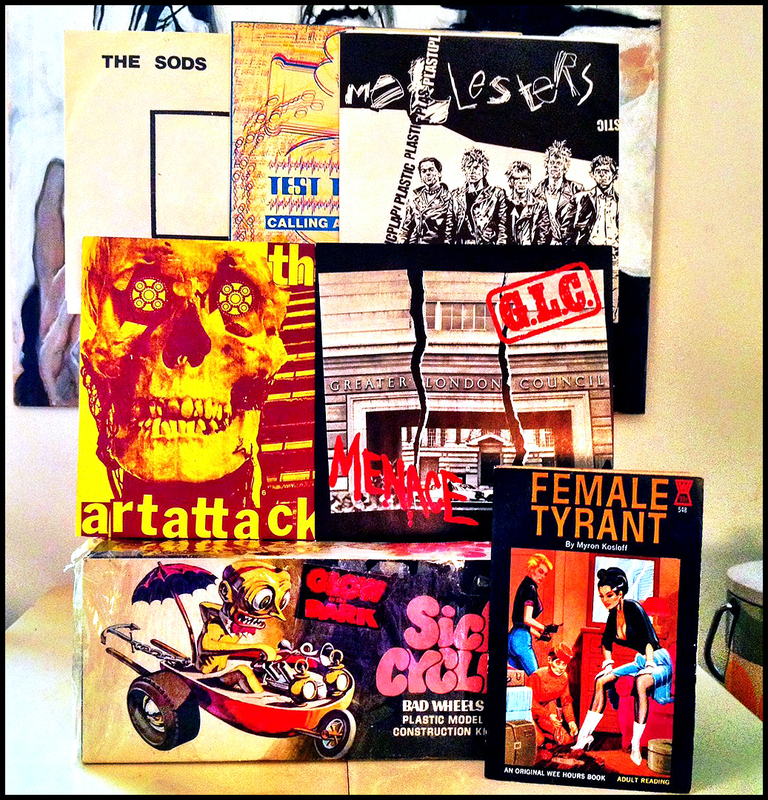 This year he lavished us with punk 45s by the Sods, Chronics, Mollesters, Art Attacks and Menace. As if that wasn't enough, an original glow-in-the-dark Sick Cycle model by Lindberg (1971) and a copy of Myron Kosloff's Female Tyrant (1966) (with its handsome Eric Stanton cover) rounded out the package. Thanks again, Mike! 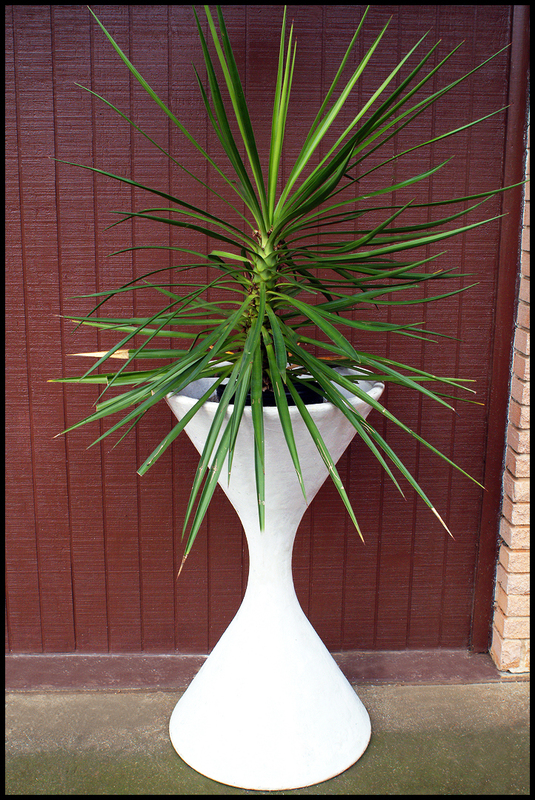 Mike also visited us earlier this year and left the above item behind as an early Christmas gift for Valery: an original Spindel planter by Willy Guhl for Eternit. Don't worry, this 38 inch beast permanently resides outside—along with its stout companion, pictured here. Both of 'em demand a new paint job and proper plantings. GG&S HQ was further beautified by Valery's folks who surprised us with a large George Nelson Criss Cross saucer. 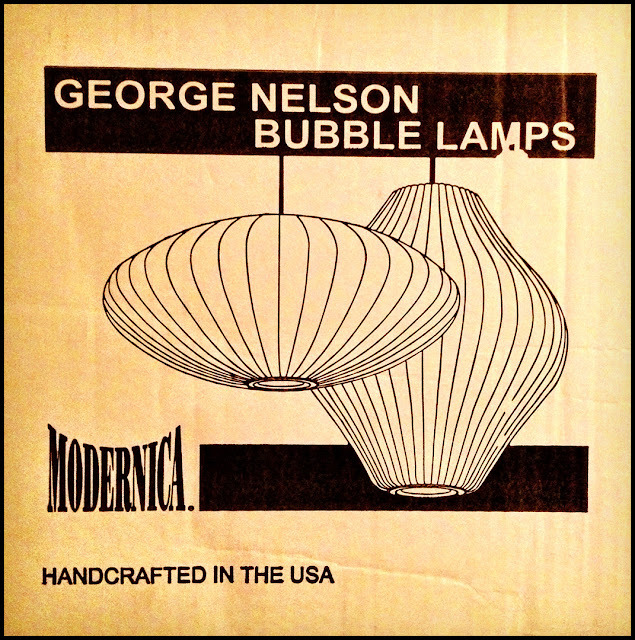 As you read this, we should be in the middle of hanging this light fixture in our master bedroom. A big thank you is in order to both Randy and Lee! Contrary to the rest of the year, no real complaints about this portion of 2012! So cool christmas gifts u got! 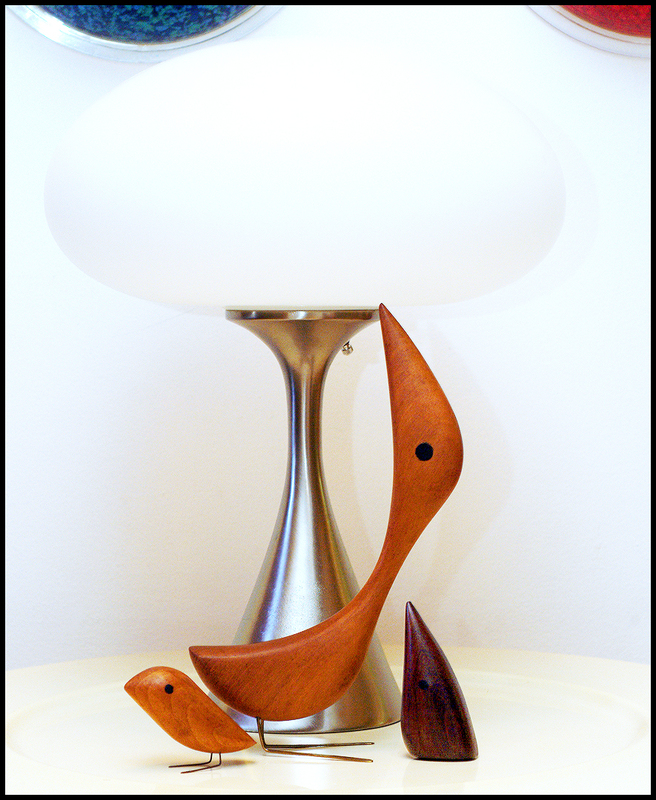 I love the wooden birds too cute! That cat is pretty sweet! Those are very beautiful jacob hermann birds. May be very valuable, if authentic. Thanks, they're all marked and were purchased before Jacob Hermann's identity was established. We have two others that are pictured elsewhere in the blog, too.